This story originally appeared in the summer 2016 issue of WV Living magazine. 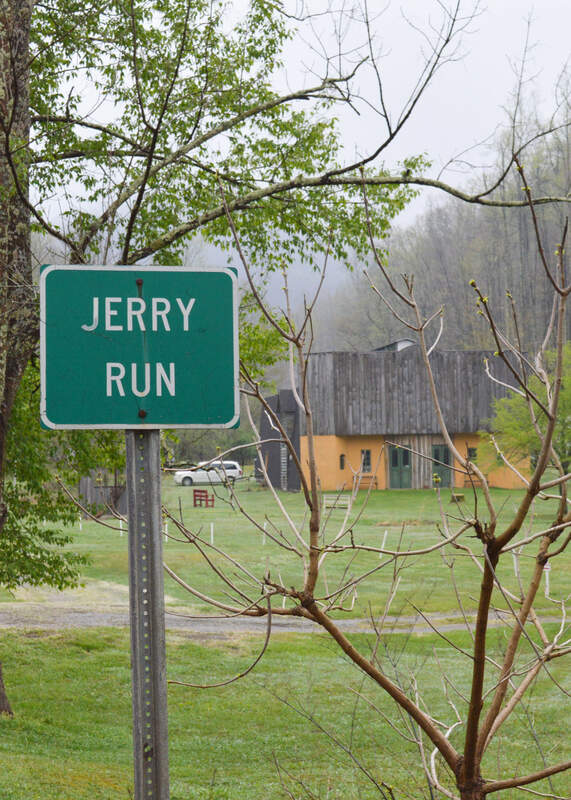 Arrive late to a show at the Jerry Run Summer Theater and you can hear the music as soon as you open the car door. Low frequencies seep from the uninsulated walls, drawing you along the worn grass path toward the green front doors. Inside, after you’ve paid the $5 entrance fee and a few bucks more for a hot dog and bottle of pop, the theater will be dark except for the stage lights and the fading sunlight that wriggles through the louvered, glassless windows. Slip into the rows of thickly padded auditorium seats and you’ll likely go unnoticed. The crowds at Jerry Run are known for their attentiveness to the entertainment. But look around. See the scores of smiling faces. Neighbors will be tapping their feet and bobbing their heads to the music, alongside folks from farther away who’ve come to see this little theater in rural Webster County. And in the corner of the balcony, show after show, you’ll find Dusty Anderson—the soundman, master of ceremonies, handyman, and janitor, and the guy who designed and built the theater from the ground up. Anderson is a lifelong music fan, having learned the basics at the knee of his organ-playing grandfather. In high school, he played electric bass in a rock band. But when he graduated and started working as a carpenter, his interests shifted—instead of playing music, he dreamed of building a place where he could host performances by other artists. He was inspired by a benefit concert he and wife Renee organized to help save the local elementary school from consolidation. The school’s gymnasium wasn’t the most acoustically appealing space, but the response was overwhelming. “People really enjoyed themselves. It brought pleasure to their lives,” says Renee. Dusty started researching theater construction, trying to find books about acoustical design at the local library. “I believe in a blueprint,” he says. The information proved lacking. Good acoustics, the authors seemed to suggest, are as much a matter of luck as anything else. This did not intimidate Dusty, however. He began making models of his theater, planning how it all would fit together. A tract of land eventually came up for sale across the road from the Andersons’ home. They bought the property and Dusty began clearing trees. He designed and built tall arching trusses that make up the building’s rib cage, hoisting them upright with some assistance from helpful neighbors. “People were thinking, ‘What’s he doing out there?’” he says with a laugh. He included skylights down the middle of the roof to provide ventilation and a little light, and built louvered windows for the same purpose. He built a tidy concession stand in one corner of the foyer and left the opposite side open for a seating area. Dusty bought a speaker system from a friend who upgraded to a more high-tech setup. “They go back to the ’80s but they sound good,” he says. The theater seats also came second-hand, from a lecture hall at West Virginia Wesleyan College. The school had planned to send them to the landfill, but Dusty spent a whole weekend hauling them back to his theater. Each seat still has a fold-up desk bolted to the right-hand side—which makes for a handy place to rest your hotdog and pop while enjoying a show. After years of planning and years of construction, the theater opened its doors in 2003. 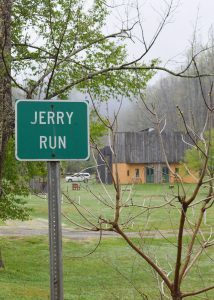 Now in its 14th season, Jerry Run hosts about 25 shows each year, beginning in late spring and running until early fall. Despite its out-of-the-way location, the theater has attracted scores of musical acts from across the state and around the country, as evidenced by the wall of framed pictures hanging in the foyer. Most are bluegrass bands—that’s what most local bands play, and that’s what audiences like to hear—but there have been rock, country, and folk groups, too. As word of the quaint little venue has spread, so has its roster. internationally renowned songwriter Sam Beam, who goes by the stage name Iron & Wine. Beam’s manager Howard Greynolds saw an article about Jerry Run in a Chicago newspaper. Greynolds has family in Clarksburg, so he decided to stop by on his next visit to the Mountain State. He asked Dusty if Jerry Run would host one of his acts someday—to which Dusty agreed, although he didn’t expect anything would come from it. “We thought, we’ll never hear from this guy again,” Renee says. More than a year later, however, Greynolds called the Andersons and asked if they would put on a special concert by Iron & Wine. Beam had been inspired by Dusty’s story and wanted to feature the theater in a short concert film to promote his new collection of early songs, Archive Series Volume No. 1. Beam’s people trucked in loads of fancy cameras and lighting rigs, along with generators to power everything. The show attracted fans from Charleston and Morgantown and Pittsburgh, along with Jerry Run’s usual band of regulars. “People were just so thrilled. The crowd was hanging on every word,” Renee says. The concert film—called “Dreamers and Makers are my Favorite People,” now easily found on YouTube—has gained Jerry Run national recognition, but it hasn’t changed the venue’s handmade charm. When the Andersons opened the theater in late April for this year’s first show, Renee was still at the concession stand, slinging hot dogs, pepperoni rolls, and popcorn with her longtime helper Barb Kopanko. Renee’s sister Linda Pugh was still behind the cash box collecting admission. “Glad to see you open again,” a woman said as she handed over her five-dollar bill. Dusty was off the stage almost before the applause began. His tall, lanky frame quickly carried him to the darkened balcony, where he took his place behind the mixing board. Next week he’ll sweep up the popcorn off the floor and wipe up any coffee rings left on the folding desks. If a breaker knocks out the lights again, he’ll be the one hunting down the problem. But while the band is onstage, Dusty can just sit back, enjoy the songs, and appreciate a music scene he built with his own two hands.